FOXBORO - At this time last year, it was thought that the future of the Patriots' defense rested in the hands of Chandler Jones and Jamie Collins - two physically gifted individuals, recent draftees headed for free agency, but accomplished enough to be seen as potential cornerstones of a successful unit for years to come. But things can change in unanticipated ways in the NFL, and so it is that as the Patriots prepare for their first playoff opponent at the end of this week, Jones and Collins have long since been dismissed and others have emerged as leaders for both now, and potentially, the future. "Trey's been one of the hardest workers on the team," linebacker Dont'a Hightower said of defensive tackle Trey Flowers. "He's one of the guys who's first in, last out. He stays after practice. For him to be playing the way he's playing, it doesn't surprise me at all." 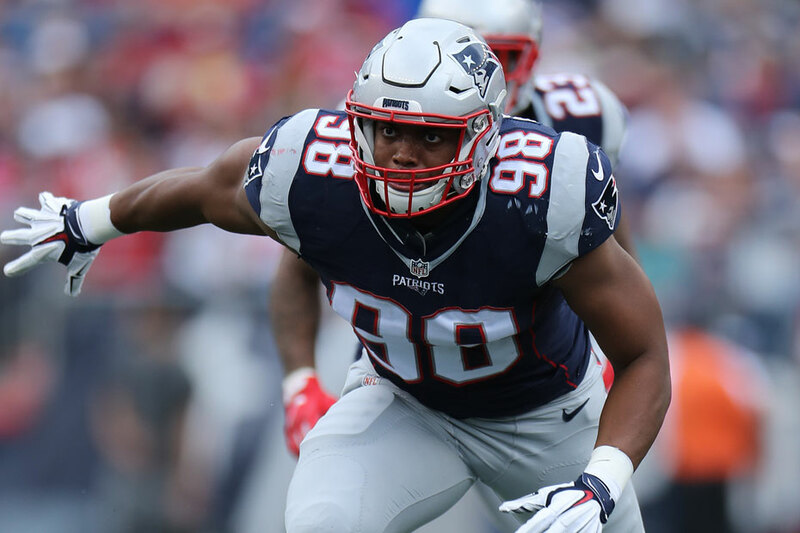 Flowers emerged from a rookie season that ended on the injured reserve list to lead the 2016 Patriots in sacks with seven, adding another team-leading 12 quarterback hits and 46 tackles, including 23 solo hits. He was practically forced into action in the first four games of the season while Rob Ninkovich sat out a four-game suspension, then proved talented enough and versatile enough to earn snaps at both end and interior tackle down the stretch run to the playoffs. "I'm impressed, absolutely, but it's expected from a guy who works as hard as he does," Hightower said of the player that has earned the nickname of "Technique" because of his devotion to film and playbook study. "We're able to do a lot of different things with him in there. He's kind of a smaller-build guy, but he plays a lot bigger than that. "You've seen that in the first three or four plays in the Miami game," Hightower continued. "I think he was in on every play. As long as he can continue to grow as a player and we can all just grow and learn from a lot of things that he's doing, a lot of those pass rush moves." Flowers said he didn't pay much attention to the pundits that said his stock was rising over the course of the season. "I just had my head down, focused, tried to do better and tried to make plays every time I'm out there," he said. "Maybe my role increased, I just made sure I was prepared for it. However many plays I get in a game, I make sure I'm productive in those plays." Hightower has also emerged as a leader. He was the fourth-leading tackler on the team with 65 (31 solo) and had six pass defenses, as well as emerging as the defensive signal-caller. That hasn't been the easiest thing, because the Patriots were already phasing in some new faces on defense after having traded Jones to the Arizona Cardinals in the offseason, and then again after Collins was dealt to the Cleveland Browns at midseason. "I feel like the communication aspect is big and it's a lot better," Hightower said. "Earlier in the year, we had a lot of new pieces, even with Shea (McClellin) coming in and Chris (Long) coming in and guys moving around and playing different spots and doing things that they weren't necessarily accustomed to, and then obviously Trey coming in and stepping up as well as he's playing. “The communication has gotten a lot better," he continued. "I think guys have gotten comfortable. I think we've kind of got that chemistry built. There have been times now that me and KV (Kyle Van Noy) can kind of just look at each other and we kind of know what to expect, what we're thinking. Whenever you get that, you can play a lot faster and kind of anticipate things. You try and get a jump on the offense." That comfort level will be important, Hightower said, as the Patriots transition from a self-improvement week to specific preparation for their first playoff opponent. "You want to play with passion, you want to play with emotion, but you also want to play smart," he said, "That's one thing we're able to do that's a real big key around here, especially in the Patriot Way, is smart football. All of it kind of boils down to when to play with emotion and when not to, and we have the right preparation, we do the right study and everything else, so it really comes down to execution. "You don't want to let down your brothers and everybody that's worked so hard to get up to this point just for an emotional play," he said. But you can forgive Flowers if he's a little emotional and excited about the coming opportunity. The Patriots' fourth-round draft pick out of Arkansas last year, he had to endure a year on the shelf before he got a real chance to prove to the coaching staff what he was capable of doing. "It's definitely a blessing," he said. "God gave me the opportunity to come out and play. Obviously, last year was a hard year for me. That was my first time sitting out since I started playing at 7 years old, so to be able to come back and just be prepared and just be able to help my team win is a definite blessing."